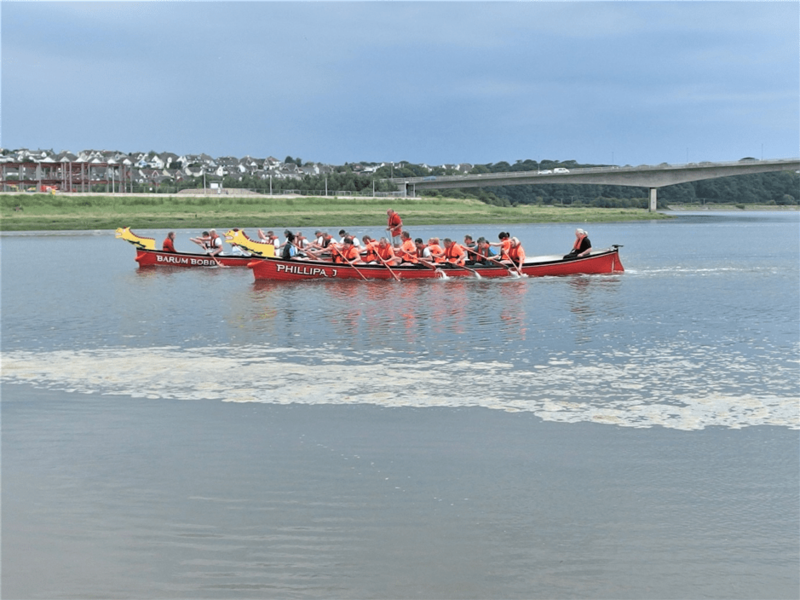 Barnstaple Pilot Gig Club finished one of their busiest weeks ever on Sunday with their third Dragon Boat Festival on the Taw in Barnstaple. Full advantage was taken of the Spring-like weather and high spring tides when the nine competing crews gathered at Castle Quay early on Sunday morning, and the first race got underway at 8.45am. The visiting Bude Pilot Gig Boat club kindly loaned their gig ‘Barrel Rock’ to race alongside Barum’s ‘Phillipa J’ and ‘Barum Bobby’ in a series of seven races from the swing bridge over the Yeo to the finish line opposite Tea on the Taw. The boats were adorned with Dragon Heads on the bow, and each had 12 paddlers for crew and a Barum helmsman. Crews came from Lyme Regis Gig Club, Bude Gig Club, Exe-Calibre Dragon Boat Club, Saunton Sands Surf Life Saving Club, Fremington Trailblazers (3 crews), Parker Hannifin in Barnstaple, and Barnstaple Pilot Gig Club. Each crew raced in one of the first three races against two other crews, and the third-placed crews from those races raced each other in race 4. The second-placed crews raced in race 5, and the first-placed crews raced in race 6 to determine the overall winner. Finally the second-placed crews from races 5 and 6 raced each other in race 7 to determine second and third places overall. Phillipa J and Barum Bobby racing each other.